Antamedia Internet Cafe software controls, secures, and enhances the running of your Internet cafe, gaming center, eSports center, library, school or hotel public computers. The software restricts access to the system, desktop, drives, folders and programs based on your settings. It helps you control and bill your customers for the Internet browsing, playing games, using Office applications, even covering retail products. 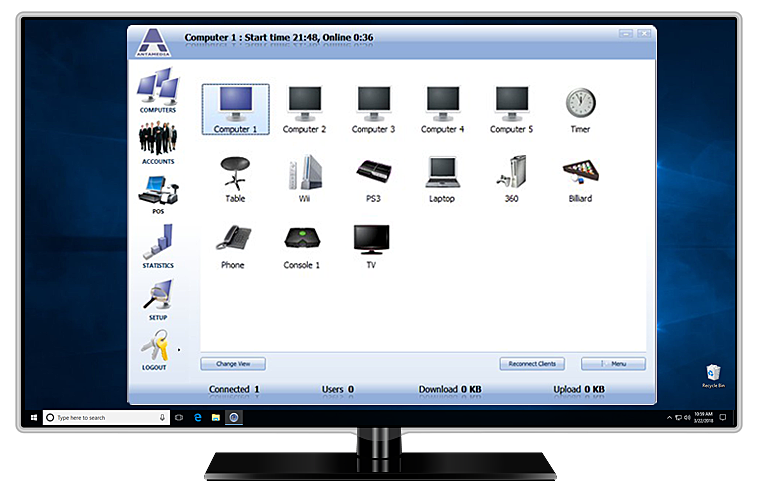 Use any Windows PC: our software ensures compatibility from Windows 7 to latest Windows versions. Install server part on your central computer from which you want to control all other clients computers. Each License includes a Server and a number of client computers. You can add more clients to any edition. If you have 10 computers and 5 consoles – you need a license for 15 clients. Each package comes with a set of WiFi connections so you can control WiFi users too. You decide how to charge for computer and console use. Charge by minute, by time blocks, decrease prices for longer use, schedule time of day with different price or allow free use. Group computers to offer standard rate and VIP computers at higher rate. Configure Price Plans to generate user accounts, refills, ticket (timecode) vouchers. Combine limits like available time, program groups, expiry date, expiration from the first or last login, daily limits (like 3 hours per day), and with the premium edition download, upload and max data transfer. Customer can use the same account for multiple logins until account expire. Restrict access to Ctrl+Alt+Del and other system keys, local drives, Control Panel. Use Internet Cafe taskbar and hide Windows Start (Orb) button on any Widnows. Employee accounts comes with different access levels like Administrator, Operator, Manager, Technical, Cashier, and configurable access rights. You can limit access to statistics, setup, account management, and prevent unauthorized manipulation which leads to money loss. Employee activity is logged with the time and type of action performed. This guide will help you install and configure Internet Cafe software on Windows 10 PC. Generate single accounts through the Easy Operator mode, or Bulk accounts. Generate multiple accounts at once and print them on paper. Modify print template with 3×4 accounts to put your logo or change layout. Cut the tickets and sell them from your front desk, nearby press kiosks, or your business partners. Print Manager module pauses each print job until customer confirms printing. A pop-up is displayed on customer computer showing document name, number of pages and print cost. If a customer confirms printing, Print Manager ads print cost on the customer bill, deducts money balance, or deduct defined number of minutes from remaining time. Variety of POS reports and statistics helps you better manage your business. Top selling products, top selling categories, top customers (so you can reward them), top vendors, top employees, top payment methods can be filtered by date range and printed. Loyalty statistics shows payments made with your customers loyalty cards. Six default categories (Internet, Games, Programs, Media, Utility, Misc) can be renamed, or desired categories hidden. There is no limit on number of applications stored in each category. Integrated language editor helps you find and correct desired sentences, or translate software to your own language. Full remote desktop control of the Client computers. Configure applications, help customers, monitor suspicious activity. Choose one of the existing client skins or configure interface for gaming cafe. You can create your own themes using white-label themes included with software, and include your own graphics. Configure applications available on your computers. Put a screenshot and description for each game or application that a customer may use. Group programs and games of your eSports center into folders and subfolders for easier navigation. HotSpot module helps you in controlling and billing your Wi-Fi customers for the Internet usage. Customer does not need to install any client software. Upon connecting to your Wi-Fi, customer may get a free trial or enter a valid username and a password in the browser to get Internet access. Create free or paid WiFi HotSpot. Limit free access by allowed time usage, data transfer, bandwidth quota limits, daily time limit, number of daily logins, number of simultaneous logins with aggregation, usage schedule, which is very practical when offering free WiFi Internet.Collect your customers Email, name, address, gender, birthday, phone, room and additional data. Add your custom fields, mark fields as required and export collected data for your marketing activity. Bandwidth quota is configured for every account and it represents total amount of traffic available to customer. Example: Customer can download 100 MB daily, 5 GB monthly or combination of these, with option to order additional bandwidth. Download and upload rate is configured for each user account separately and it represents speed of customer connection to the Internet. You can sell high rate accounts for additional fee or save more bandwidth for VIP customers. Example: set 10 KB/s for regular accounts and 100 KB/s for special accounts. Customer can browse specified host sites without authentication. You can allow browsing of company website with advertisement free of charge. If customers wants to find out more, login will be required. Download Internet Cafe Software now! 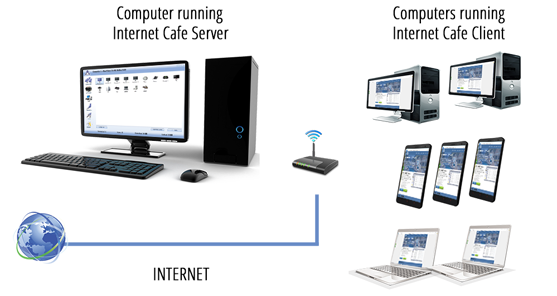 Internet Cafe software is created with your needs and concerns in mind. It easily scale from a little Cyber Cafe shop to a major eSports center chain with the same simple interface. Tight control of your employees, POS system that bills additional services, accept credit cards and offer automatic payment and signup. Various reports provides instant access to statistics, current stock. Save your time, money and effort ! 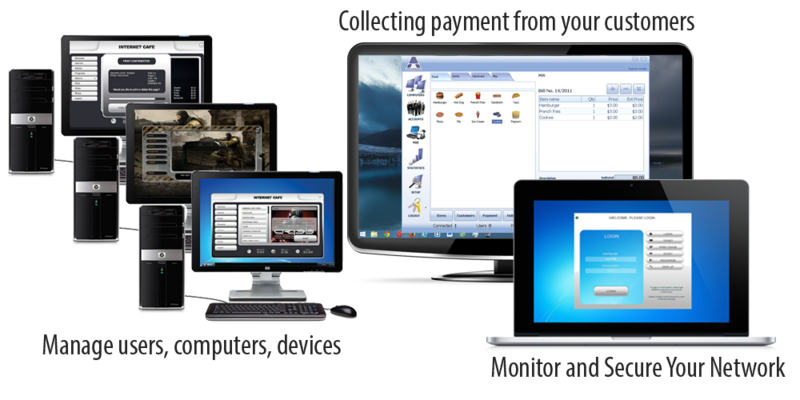 Internet Cafe software is first Antamedia brand application. It was providing basic control over Cyber Cafe in late 1999 when it is developed. Internet Cafe software grow over time with customer business and their users expectations and needs. What is Antamedia Internet Cafe ? Antamedia Internet Cafe is a Windows based client / server application that secures public Internet computers, kiosks, self service devices, controls WiFi HotSpot laptops and mobile devices, provides POS facilities and much more. Your public computers are protected with the Client Login screen, while HotSpot module shows login screen in the user’s browser. Customers are prompted to enter valid username and password to get Internet access, or to start playing games or using programs. After successful login, your customer will see the remaining time and bandwidth quota, expiration date and other relevant info. Internet Cafe software offers different templates for accounts, refills and receipt printing. Tickets can be printed when needed, or in advance, for example 100 tickets printed and distributed to various sales locations. Tickets can expire from first use, and optionally expire specified number of days from the last customer login. Offer discounts for desired products to stimulate sales. You can easily define promotion intervals for a product, or product categories, or configure up to three happy hour intervals. Save time and resources by allowing the customer to create account and pay for use directly from the client computer. The secure automated payment process lets you accept over 70 major internet payment gateways including PayPal. Keep 100% of the profits. Internet Cafe Credit Card Payment Module License is sold separately. If you run cafeteria or restaurant, you can handle all customer orders using tables. Just add tables and you’re ready to run additional business from the same software. Displays advertisement on the client interface. Flash or image is displayed after customer login for specified time. After that customer gets an access to the menu interface to start working or playing. Who is Using Windows Internet Cafe Software? Our software helps you easily start and grow. Maintain customer accounts, accept credit card payments with 100% of profits, store billing data, statistics and usage reports, all within a single application. Build your WiFi and wired network with any hardware you already own. Configure games available to customers, easily control Internet use, create complex price plans, maintain customer accounts and get robust reports on game statistics, billing, usage, bandwidth, URL logs. It supports wired and wireless connections and it’s hardware independent. Educational institutions grants students and visitors limited access, usually monthly renewable and with time limitations. Block access to sensitive computer resources and allow access to important application for your students at the same time, track usage logs and get real-time statistics. Setup, manage and control your eSport Center. Bill your customers for playing games, Internet use or additional WiFi access during their stay. Advanced user management, time tracking, pre or post-paid billing, POS sales, PC security, staff management and many other features will help you run a successful eSport center. Install server part of the software on your main PC, and client part on all other computers in the network. If you wish to control WiFi devices (phones, laptops, tablets), you will need two network cards in your server computer. Server and clients can run on any supported Windows OS – from Windows 7 to Windows 10.